Horses can lead colourful and memorable lives, just as humans can. In the grand history of the Thoroughbred there have been many such individuals. Perhaps one of the more intriguing females in this corner is the life of the great Canadian champion Fanfreluche. Fanfreluche was a champion on the track, a champion broodmare and is in the Canadian Racing Hall of Fame. She had liaisons with some of the finest Thoroughbreds of her era, such as Buckpasser, Sir Ivor, Secretariat, Tentam, Hoist The Flag, and Alydar. She was kidnapped, found wandering on a country road, adopted as a family pet, all while in foal to a legend, and subsequently returned to her rightful owner. She was well loved by all who had contact with her and lived until the ripe old age of thirty-two. Fanfreluche was bred and raced by Jean-Louis Levesque in 1967 from the outstanding stakes winning broodmare Ciboulette. Fanfreluche was a bay filly by the incomparable Northern Dancer, and comes from a very productive and noble family of Windfields Farm breeding excellence. The second dam of Fanfreluche is Windy Answer, one of the key foundation mares to Windfields’ world class legacy. Windy Answer was not only the dam of Ciboulette, but also Breezy Answer, champion Cool Reception and his full sister Icy Reply. Among the world class descendants from Windy Answer are Hear Music, Brazen Beau, Arctic Blizzard and Talc Shaker. Ciboulette, purchased as a yearling by Levesque from Windfields, produced two full brothers to Fanfreluche in the flashy chestnut stakes winner Barachois and the successful sire of seventy-eight stakes winners Night Shift, whose multi group one stakes winning son Azamour was a very successful stallion in Ireland and New Zealand until his tragic passing in 2014 at the age of thirteen. Ciboulette is also the tail female ancestress of graded stakes winners Coco La Terreur, Cristofori, Chapel Royal, Gypsy Diamond, Regal Solo and three time group one stakes winner Charm Spirit, who is a popular shuttle sire between England and New Zealand, and now France for keen breeders. With regal bloodlines on both the top and bottom of Fanfreluche’s pedigree, it is no wonder that she would be the star she became on the track. As a two year old she captured the prestigious Princess Elizabeth Stakes on dirt and the equally prestigious Natalma Stakes on grass. She added the Fleur de Lys Stakes and finished second in the Mazarine Stakes. In her two major stakes wins as a two year old she defeated South Ocean, who would later earn fame as the dam of Storm Bird. The following year as a three year old, Fanfreluche competed against the best three year old fillies on the continent. Her piece de resistance came in the historic, and very prestigious Alabama Stakes at Saratoga. In the race she defeated the top three year old fillies in training, which included Office Queen. Fanfreluche added the Selene Stakes, Bison City Stakes, as well as the Manitoba Derby and Quebec Derby over the boys. She was upset in the Canadian Oaks by South Ocean, finished second to Almoner in the Queen’s Plate and to Mary Of Scotland in the Wonder Where Stakes. Her forays into the U.S. included not only her Alabama Stakes victory but also a second to long shot Taken Aback in the Spinster Stakes and a third to older mares in the Gazelle Handicap. In the Spinster she was giving weight to all others entered, including ten pounds to the winner. Her final race was an invited entrant to the Washington D.C. Invitational, where she led for the first mile only to run out of gas. The one and one half miles distance would prove to be too much for her at the top level of racing class. Fanfreluche was named as the co-Champion three year old filly in the US with Office Queen, and also earned the Canadian horse of the year Sovereign Award. Always known a as kind and engaging filly, “Fanny” would now enter the broodmare colony to Levesque’s breeding endeavour. She had acquired the nick name Fanny during her racing days, and the name would stick for the rest of her life. Her sire Northern Dancer, now acclaimed as the greatest sire of sires in history, was also a very successful sire of broodmares, although in 1971 this was not known since Fanny was from his second crop and Northern Dancer was in the early stages of establishing his sire legacy. Northern Dancer to this day is the broodmare sire of over two-hundred stakes winners. Fanfreluche became a big contributor to this total as she is the dam of six stakes winners, three of which are champions. Fanny’s first foal was a memorable one. L’Enjoleur became the first two time winner of the Sovereign Award as Canadian horse of the year. He won his first such award as a two year old when he captured the Coronation Futurity, Cup And Saucer Stakes, Summer Stakes, Clarendon Stakes, Winnipeg Futurity. He then raided the US, winning the grade one Laurel Futurity over future three year old champion Wajima, equalling the one mile and one-sixteenth track record in the process. His winter and early spring of his three year old season was marred by nagging injuries and a case of colic. He was the winter book favourite for the Queen’s Plate and second choice for the Kentucky Derby. He did not make it to the Derby due to his infirmaries, but did make it to the Queen’s Plate. L’Enjoleur had only one victory from seven starts as a three year old, the Quebec Derby, leading into his start in the Plate. In the race, L’Enjoleur regained his strength and superiority, winning the Canadian classic in a time of only three-fifths of a second off the race record. L’Enjoleur continued his fine form when he captured the second jewel of the Canadian Triple Crown the Prince Of Wales Stakes at Fort Erie but was conquered by grass specialist Momigi in the third leg, the Breeder’s Stakes at one and one-half miles. L’Enjoleur later won the Manitoba Derby, Harry Jefferies Stakes, O’Keefe Invitational Handicap and Colonel R.S. McLaughlin Handicap, which cemented his second successive Sovereign Award as Canadian horse of the year. He won stakes races from six furlongs to one and one-half miles in his Hall of Fame career. L’Enjoleur, who was sired by the legendary Buckpasser, became a good sire getting thirty-two stakes winners. As with his sire, he would be known primarily for his daughters. Avowal and Par Excellance are both multi champion fillies. He is also the sire of That’s My Hon, the second dam to current world class sire Kitten’s Joy. Fanfreluche produced stakes winner Grand Luxe by Sir Ivor in 1974. Grand Luxe had a productive career at the track with ten wins from twenty-five starts, and an additional seven in the money finishes. Three of her wins were in stakes races, including the Fury Stakes. Grand Luxe is found in the pedigree of recently retired champion Australian sire, and multi group one stakes winner Flying Spur. Danehill son Flying Spur is out of Rolls, a daughter of Grand Luxe. Rolls in turn has also produced Shoal Creek who is the dam of another champion Australian sire in Encosta De Lago, a son of Sadler’s Wells full brother Fairy King. La Voyageuse became the second champion produced by Fanfreluche. La Voyageuse was a tough honest competitor making fifty-six starts winning twenty-six races, placing second ten times and third seven times. La Voyageuse won championships in three consecutive seasons from the age of three to five. Her sire was Tentam, an almost black stallion who stood at Windfields Maryland until his early death at the age of twelve in 1981. La Voyageuse had prestigious wins in such races as the Canadian Oaks and against males in the Nearctic Handicap , Canadian Handicap, Bison City Stakes, and twice won the Matron Handicap. She is the second foal of Fanfreluche to be inducted in the Canadian Racing Hall of Fame. Descendants of La Voyageuse such as European Champion two year old filly Bint Allayl, current sire Kheleyf at Kildangan Stud in Ireland, French Braids in Australia and Time Bandit in the US have kept the name of La Voyageuse in pedigrees of modern stakes winners around the world. Medaille d’Or was the third champion produced by our heroine Fanfreluche. Medaille d’Or was sired by Secretariat and foaled in 1976. He resembled his sire in colour and conformation, only being slightly shorter at 16.0 hands as opposed to Secretariat being 16.2 hands. Medaille d’Or was the 1978 champion two year old in Canada after his resounding victory in the Coronation Futurity. He stood at Windfields in Maryland until his early demise at the age of ten. He sired eight stakes winners including multi stakes winner Tour d’Or, who went on to be a regional sire of interest in Florida. On June 25, 1977, the year after Medaille d’Or was foaled, his mother Fanfreluche was kidnapped while in foal to his father Secretariat from her paddock at Claiborne Farm in Kentucky. A massive search involving local police and the FBI was conducted. The abduction made national headlines in the papers and on TV. While there were no leads that led to her immediate return, Fanfreluche would eventually be found one hundred and sixty miles away, in December of the same year. She had been discovered wandering a country road near Tompkinsville, which is close to the Tennessee/Kentucky border. Larry McPherson and his family found her and adopted her without any knowledge of who this mare actually was. They named her Brandy and treated her as a family pet and riding horse. It was no strange occurrence to the family who had had many a stray horse or cow show up on their property before. Eventually the FBI received a tip about Fanfreluche and discovered her at the McPherson farm. The McPherson family surrendered “Brandy” most willingly upon the discovery of her true identity. Larry McPherson had actually refused a two hundred dollar offer from someone willing to buy the mare, saying that he believed that the rightful owner would eventually surface, so he and his family took care of her in the mean time. Brandy, I mean Fanny, or shall we say Fanfreluche, was in very good health and very pregnant when she was recovered. The FBI would eventually locate and apprehend the actual culprit who did horse nap Fanfreluche, obtaining a conviction in the courts. Levesque offered a one thousand dollar prize for anyone who could come up with a catchy name for the foal Fanny was carrying at the time. The name “Sain et Sauf” was selected. This French name translates to “Safe and Sound” in English. Sain et Sauf would turn out to be a modest winner of three races in his career. Fanfreluche produced one more stakes winner, a full brother to Medaille d’Or and Sain et Sauf, in 1979. His name was D’Accord. By this time Fanny had been sold by Levesque to Bertram Firestone for $1.3 million. D’Accord won the Breeder’s Futurity as a two year old, and later had a nice career at stud getting twenty stakes winners, which includes graded stakes winners Warfie and Yesterday’s Kisses. He is the dam sire of grade one stakes winner D’Wildcat, sire of multi graded stakes winners D’Funnybone, Wildcat Red and Authenticat. 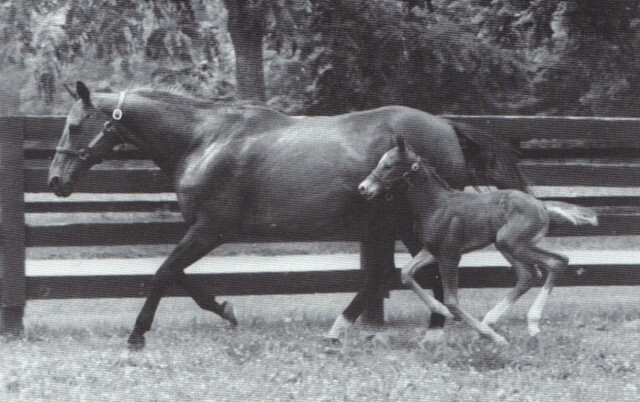 Fanfreluche tended to produce her foals in the image of the foal’s sire. L’Enjoleur looked very much like Buckpasser. Medaille d’Or was a carbon copy of Secretariat. La Voyageuse was in the image of Tentam while Grand Luxe was so named due to her remarkable resemblance to the impeccable Sir Ivor. Fanny was one the first champions sired by Northern Dancer, as she was from his second foal crop, and would be a great advertisement for the then emerging world class sire. Likely due to her good nature and intelligence, Fanfreluche could take everything in stride. She certainly had an eventful and extraordinary life. As I have already stated, Fanfreluche was thirty-two when she passed away, due to the infirmities of old age. She was a lovely bay with two white socks on her hind feet and a small star on her forehead. At 16.0 hands she was of average height and her conformation was exceptional. She was also one of the first Thoroughbreds I had a chance to enjoy and cheer for. In other words, Fanfreluche has had a profound effect on my early love of the Thoroughbred, which has never waned, and she holds a very special place in my heart. Fanfreluche was an exceptional and very memorable Thoroughbred on many levels. She was a bright flame that has lasted well beyond her long and remarkable life. Great story and info! So glad I found your site. Being based down south in NZ, the references to Flying Spur and Encosta de Lago are interesting. They have been top notch sires in Australia for many years and their legacy will live on. However, the name that piqued my interest was Night Shift, who is the sire of Align, a grand stallion (now approaching 20) standing at Highview Stud in the Waikato in NZ. I have just started writing news items for Highview and this weekend did an article on two classy offspring that had victories on the weekend. (http://www.highview.co.nz/News/Great-Weekend-Double-for-Align). In particular, I expect to hear a bit more about Ryan Jim, who not only is a half-brother to a NZ Group 1 winner in Ryan Mark; but more importantly, shows the type of acceleration required for high performers. It is wonderful to read a great story about a famous Canadian horse. I really enjoyed this article and thank you for posting it. Wonderful to read stories of these marvellous mares. I am based in Australia, and have recently purchased a yearling filly who is a tail line great granddaughter of La Voyageuse. I hope she proves to have some of her families quality. Growing up in the 1970’s, as a horse smitten young lady, “Franny” was a hero I followed & cheered for on the track. It is wonderful to learn so much more about her. I love this story of Fanny and her family. I bought my first Fred Stone print in the 80s and it was the Kidnapped Mare. It was her and her Secretariat colt.